How much you need to qualify a gold deposit in advance depends upon the additional investment that will be required to gear-up for production. 1) Discovery: Attempting to locate a higher-grade deposit of value inside of a larger volume of lower-grade material. 2) Quantification: Extracting and analyzing smaller portions, to gain a perception of how much value exists within a larger volume. The general concept behind sampling is to minimize investment into a specific mining property, or a particular project, until there is enough proof that a mineral deposit exists which contains enough value to justify a more substantial investment. The kind of sampling that you should do, and how much is necessary, largely depends upon the ultimate objectives, and/or how large of an investment you will make to implement a commercial project – especially that portion of the investment which cannot be recovered and re-committed to some other project at a later time. 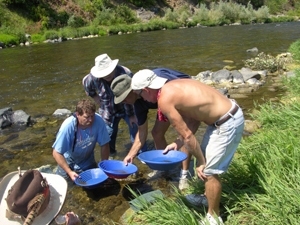 For example, if you are going to join The New 49’ers Prospecting Organization to gain access to 60+ miles of mineral properties in northern California, and decide to devote an extended period of time into searching for and developing high-grade gold deposits along those properties, the money you would spend outfitting yourself with a sampling dredge is something you can depreciate over the extended period. This is because the investment will not be confined to a single mining project or property. When you are done, because the dredge and gear will be accessible, you can regain some of your investment by selling the used equipment. How much sampling would be necessary in advance of making this investment? Not so much, because most of the investment is not committed to a single mining property. Before a final decision is made, perhaps it would be worth spending a week of your time participating in a Group Mining Project, to obtain some direct exposure to the activity, and see if this is how you want to spend your time. 2) Quantify the deposit(s) well enough to become certain that the commercial value of the project is justified. 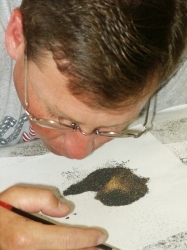 Sampling is a careful, organized method of attempting to locate high-grade mineral deposits; and then, obtain a reasonable perception of the value they contain. 1) The larger the sample, the more accurately the sample results will represent the larger volume of material that has not been analyzed. 2) The more samples you take, and the closer they are together, the more accurately the average result will represent the larger volume of material that has not been analyzed. 3) To achieve an accurate result in sampling, it is vital that you thoroughly clean all of the values from sampling equipment in-between samples. 4) As mineral deposits can be found at different strata’s within a streambed, a good sampling program does not only test in different geographic locations; but also at the different layers within a streambed. This is because it can often be more commercially-productive to mine a deposit only down to a specific strata. 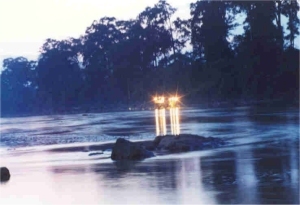 On this river in Madagascar, the gold (plentiful) was so fine, the sample material had to be dredged into a large catch basin suspended between two boats, and then processed using specialized equipment on the bank. 5) To be effective, recovery-equipment used in sampling must have the capability of concentrating the values which exist within the deposit. 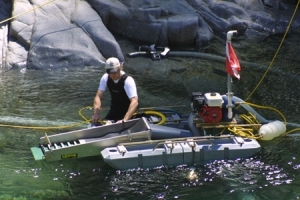 Where special recovery equipment is needed, and the sampling must be accomplished with portable dredging equipment, it is sometimes necessary to dredge the samples into a floating catch-container. 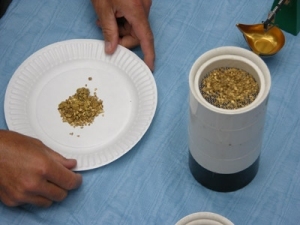 Then the samples can be carefully processed on land. 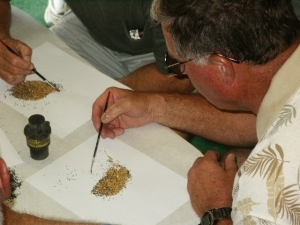 Sizing the gold being recovered, and the gold that is not being recovered, is an important part of a sampling process. 6) Care must be taken to ensure that foreign material is not introduced into the material being sampled which can render the result inaccurate. Just as this has to do with foreign material from other geographic locations, it also has to do with material from different strata’s within the streambed, if layers are being tested independently of each other. 8) Tailings from a sampling recovery system should be carefully analyzed to see what values are being lost; and whether steps can be taken to recover the values in a production operation. 9) Ultimately, only the values that can be recovered during production should be included in the final business projections. 10) Care must be given to measure the amount of raw volume that is excavated to extract a sample. Because the value recovered must be related back to the amount of material that was moved and/or processed to obtain the result. This relation will need to be measured against the volumes and costs associated with a potential production operation. For example: If an average cubic meter of streambed gravel to be processed will produce $10 in gold (gold at $425/ounce), at a gross production cost of $4 per cubic meter, when a production dredge is operating at 100 cubic meters per day, you can predict a net income of $600 for each dredge participating in the program. 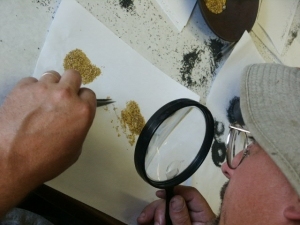 Sampling is generally accomplished in two steps: The first step is to locate the existence of a mineral deposit. Usually, when we use the term “preliminary sampling program,” we are talking about a project where the existence of high-grade deposits still needs to be confirmed. The second step is to sample the deposit(s) enough to gain a perception of its value. And that’s what this article is really about; how much quantification is necessary? The answer to this question largely depends upon the additional investment that will be required to gear-up for the desired volume of production. 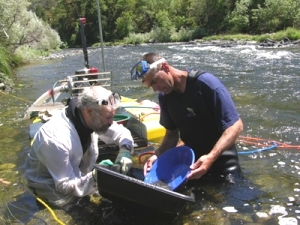 Where we dredge along the Klamath River in northern California, using the very same equipment and support-structure in sampling as we do in production, we do not have to do very much quantification of a deposit before launching into production. This is because just finding the high-grade is reason-enough to mine it. 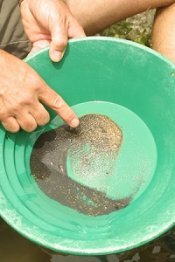 Although, we usually do devote several samples in an effort to find a low-grade area where we can place tailings. Then, we establish the value of the deposit as we mine it. The reason we can do this, is that under these circumstances, there is no substantial amount of increased financial risk when we transition from sampling into production. 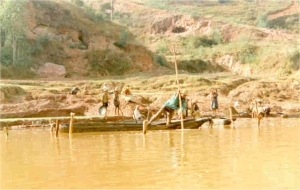 Local miners were recovering rich deposits in the Cambodian jungle using very primitive, low-volume methods. Here was a good place to start with a sampling dredge. However, many situations are different from this. Some mining projects are just in the start-up phase. Some mining prospects are in remote locations. Under many circumstances, to minimize risk, it is wise to begin with portable sampling equipment to complete the preliminary sampling phase of the program. 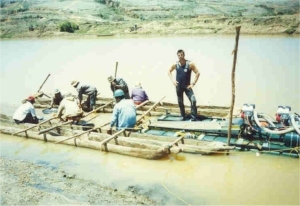 Local miners were supporting their villages in Madagascar by digging gravel from the bottom of the river out of boats using long-handled shovels. Our sampling later proved they were digging on the strongest line of gold in the river. In this case, the question remains how much quantification is necessary to support the evolution to the next level of operations? This will always come back to the program objectives – which often have to remain flexible, depending upon what is discovered during sampling. 1) Doing enough additional samples to prove that a high-grade deposit justifies bringing in a larger-sized suction dredge to go into production. As part of this, it is important to work out the best type of recovery system to use, and decide how many production-shifts you will run. Night operations require special lighting equipment. 2) Doing enough samples along a stretch of river to prove that high-grade deposits are extensive enough there to justify bringing in multiple production dredges, and setting up a substantial support infrastructure. 3) Doing a series of controlled samples, an equal distance apart, along a portion of a river, to statistically-quantify the value of a mineral deposit. This is often done under the watchful eye of a consulting geologist who will certify the results in preparation for a larger-scale mining operation with the use of mechanized machinery that might float on platforms. 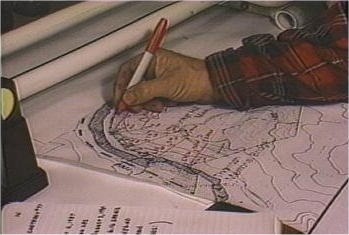 4) Doing a series of controlled samples, an equal distance apart, for some distance across an entire section of river, to quantify the average-value of the river gravels. This almost certainly would be accomplished under the guidance of a consulting geologist(s) who will certify the results, in preparation of financial instruments for investment bankers or a public trading company.